I've held on to this photocopy of a photo I took of Michael Vick in August 2001. Perhaps I clung to the sheet of paper because what I witnessed on that hot South Carolina day, spoke volumes to me about his character then. So now, the indictments passed down this week don't surprise me at all. My sports editor and I travelled to NFL training camps down in Greenville and Spartenburg to grab shots and interviews of both the Falcons and the Panthers coaches and players. I had just finished taking action shots of Vick when my collegue started interviewing head coach, Dan Reeves. We were the only media present. There were plenty of bystanders, but the crowd was thin. As I was shooting Reeves, I noticed Vick was released from practice and headed towards his parked scooter. This kid saw him as well and went towards him. My instinct was to watch their interaction, hoping for a tender fan encounter a la Mean Joe Greene style. What I saw instead, and recorded, was this child, football in hand, waiting to see if Vick would acknowledge his presence. 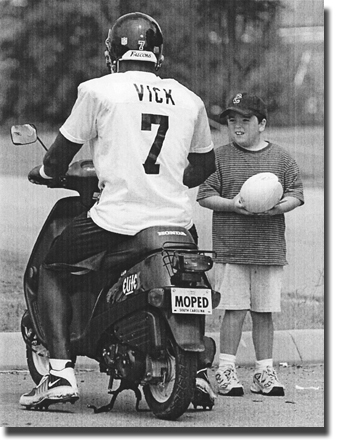 The kid obviously wanted Vick to sign the football, but never asked him to. He politely waited while Vick ignored him. Then, much to my amusement, Vick's moped wouldn't start. For what seemed like five minutes, I watched as he tried to kick start his scooter to escape this kid. Now I don't know if Vick's agents ever told him not to sign footballs and sports cards for people because of the Ebay factor, but surely they didn't tell him to not smile and acknowledge little fans? For me, it was glimpse into the lack of human decency of Michael Vick. It is too bad for him he never met Jerry Moore, maybe he could have learned a few lessons from him.